Investing in Northern Trust FlexShares dividend ETF Funds can provide growth and dividend income opportunity. There are 6 dividend ETFs for investment. Exchange traded fund is popular among investors and traders nowadays. You can invest in stock ETF or bond ETF. Most of exchange traded funds is an index ETF. This low cost index ETF can provide instant diversification opportunity for investors. Recently, Northern Trust provides a big ad of FlexShares ETF Funds. 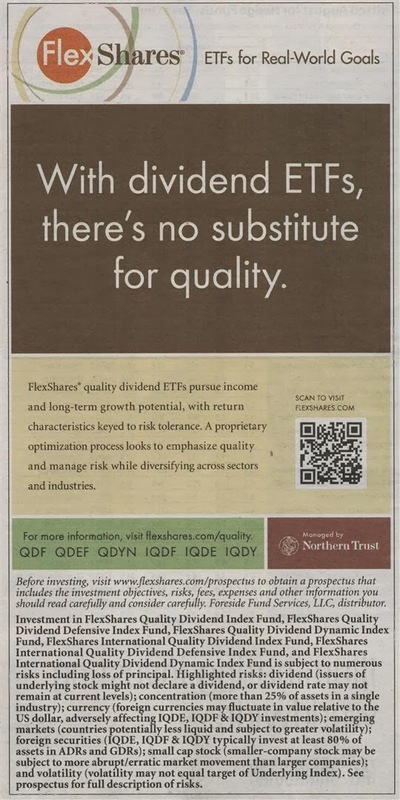 According to the ad, these exchange traded funds are part of high quality dividend ETF funds. There are 6 ETF funds in the ads including U.S. dividend stock ETFs and International dividend stock ETFs. Whether you should invest in these ETFs, you need to do research and review for them. With dividend ETFs, there’s no substitute for quality. For more information, visit flexshares.com/quality. The FlexShares Quality Dividend Index Fund has total net assets are $295 million. It has a total of 198 holdings. The yield is 2.46%. This exchange traded fund seeks investment results that correspond generally to the price and yield performance, before fees and expense, of the Northern Trust Quality Dividend Index. It uses Dow Jones US Select Dividend Total Return Index as its benchmark. It has annual expense ratio of 0.37%. This U.S. stock ETF fund has a total return of 36.29% in 2013. There is no rating yet by Morningstar. The shares price is $33.00. The top 3 stocks are Wells Fargo & co, Pfizer, and Cisco Systems Inc. The next fund is FlexShares Quality Dividend Defensive Index Fund. The fund’s CUSIP is 33939L845 and it was incepted in December 2012. The current dividend yield is 2.29%. This stock ETF is tracking its index, Northern Trust Quality Dividend Defensive Index. This exchange traded fund also has YTD return of 31.03%. The top holdings as of November 18, 2013 are Exxon Mobil Corp NPV (4.77%), Pfizer Inc (3.76%) and JPMorgan Chase & Co (3.39%). The top sector allocation is Financials (17.48%). The FlexShares Quality Dividend Dynamic Index fund seeks investment results that correspond generally to the price and yield performance of the Northern Trust Quality Dividend Dynamic Index. It has annual expense ratio of 0.38%. It has average beta of 1.30. The total net assets are $12 million. 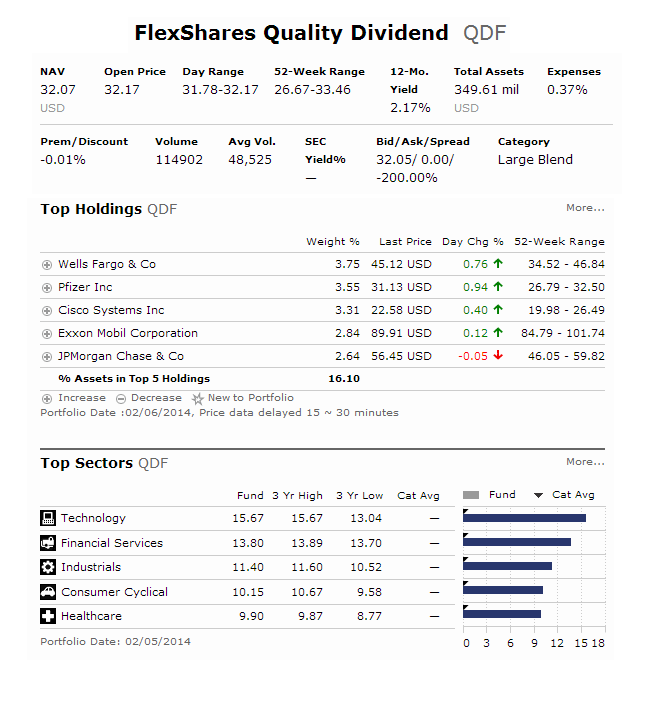 Wells Fargo (3.85%) and Pfizer (3.75%) are the top holdings in this FlexShares Quality Dividend Dynamic Index fund. You can buy this dividend ETF from your brokerage with as little as 1 share. The next fund managed by Northern Trust is FlexShares International Quality Dividend Index Fund. It has just been incepted in April 2013. Its annual expense ratio is only 0.47%. It uses Dow Jones Global Select Dividend Total Return Index as its benchmark. The 52 week price range is between $23.11 and $27.58. The current shares price is $26.77. In its short term introduction, it has a total return of 12.56%. The top stocks are Commonwealth Bank of Australia (3.01%), British American Tobacco (2.83%) and GlaxoSmith Kline (2.20%). The fifth fund in the ad is FlexShares International Quality Dividend Defensive Index fund. This ETF has annual expense ratio of 0.47%. The fund’s CUSIP is 33939L811. It has 213 total holdings. The total net assets are $15 million. It also has dividend yield of 1.38%. 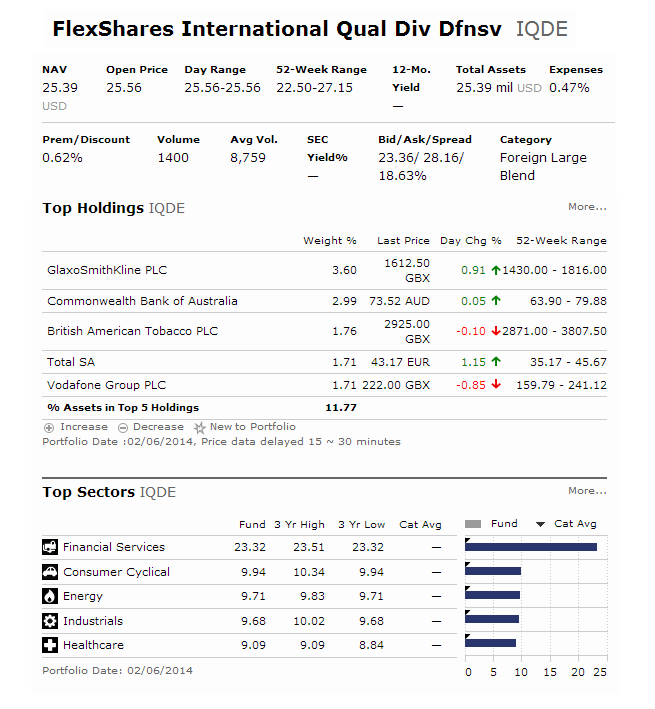 The top holdings as of November 18, 2013 are GlaxoSmithKline (3.45%) and Commonwealth Bank of Australia (3.15%). The last fund in this advertisement is the FlexShares International Quality Dividend Dynamic Index Fund (IQDY). It has been in the market since April 2013. It has $8.2 million of total net assets and 3.50% dividend yield. The annual expense ratio is 0.47%. This international stock fund has a total of 220 holdings as of November 2013. The top holdings are Commonwealth Bank of Australia (3.02%) and British American Tobacco (2.65%). In 2014, the year-to-date return is -2.30%. These ETF funds provide low cost opportunity for investing in dividend stocks. Since the ETF trading volume is low, you might want to use limit order when buying these ETFs. There is still no long term performance; hence no one will know how the ETF is tracking its index or any tracking error.